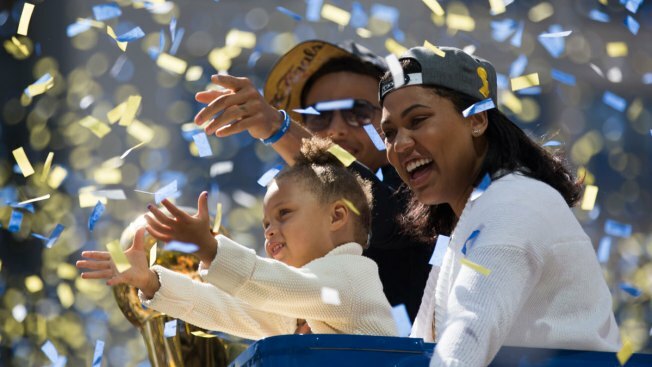 Stephen Curry, daughter Riley Curry and wife Ayesha Curry celebrate as confetti falls during the Golden State Warriors Victory Parade in Oakland, California. It's not basketball, but fatherhood, that’s landed Warriors’ Steph Curry on yet another magazine cover. However, it's adorable shots of daughters, Riley and Ryan who steal dad's spotlight on the June issue of Parents Magazine. Inside, Curry and wife, Ayesha, talk about co-parenting, the pitfalls of social media, and how Riley calls daddy "Steph Curry" once he steps into his Golden State uniform.